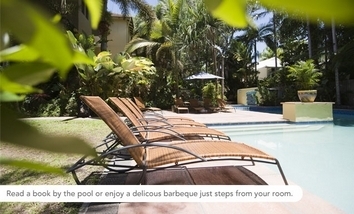 Providing the perfect base to explore the nearby Great Barrier Reef and Daintree Rainforest, Reef Club Resort offers accommodation in an excellent location. Reef Club is just a minutes walk from the world famous Four Mile Beach and a ten minute stroll from the vibrant Cafes, Bars and Restaurants of Macrossan Street. 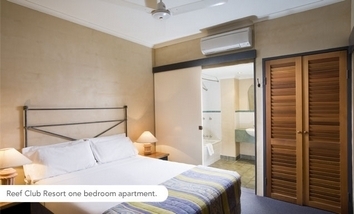 The self-contained apartments have a rustic Mediterranean feel with terracotta floors, timber louvers and earthy tones reflecting the tropical style of North Queensland. Offering One and Two bedroom apartments, Reef Club is the perfect getaway for couples and families. After taking in the sights and sounds of the many Port Douglas attractions and tours, Reef Club provides a private ambience and cool retreat in the tropics. Surrounded by tropical foliage and shady palms the swimming pool and outdoor spa is the perfect place to bask in the tropical sun or have a barbeque where you can enjoy fresh local seafood. Stay 2 nights in a 1 bedroom self catering apartment and have a cozy night in with FREE DVD hire from the resorts library and complimentary aromatherapy bath salts to ensure a romantic night away ! 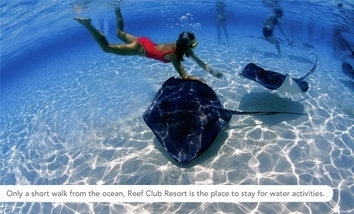 FREE $100 tour credit- stay 4 nights in a 1 bedroom self catering apartment and Explore the Reef & Rainforest ON US. Family Fun close to beach & town. Stay 2 nights in a 2 bedroom self catering apartment and have a night in with FREE DVD hire from the resorts extensive library & Complimentary use of Popcorn machine. After Hours For guests arriving after 5pm Mon - Friday, after 4pm Saturday or after 2pm Sunday please contact resort direct to make arrangements with Manager. Photographic ID and a credit card will be required for check in. No cash deposits taken. Extra Guests are charged at $35 per night payable direct to the resort. 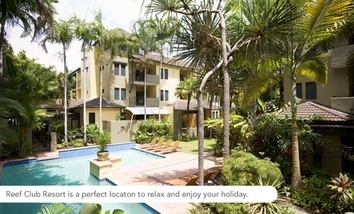 Reef Club Resort is located approximately 60 kms north from Cairns Airport. Transfers are available by contacting the property direct with your flight details. 4WD excursions north to Cape Tribulation visiting beaches such as Cow Bay, Alexandra Bay and Noah Beach.